Wednesday is Ukraine‘s Day of National Unity, but the country has never felt so divided. Two protesters were shot dead during clashes with police, who attempted to take back control of the city centre. Prosecutors confirmed earlier claims by the protest leaders that the pair had been shot with live ammunition. A third protester died after falling from a high column at Dynamo Kiev’s football stadium while fighting with police, Reuters reported. Riot police pulled back from further clashes but were involved in a protracted standoff with protesters near the Dynamo Kiev football stadium overnight. People brought thousands of tyres to create a blazing wall in between the police lines and the protest barricades. At midnight, a full-scale firework display was launched, with the rockets aimed horizontally at police. On Independence Square, the already formidable barricades were augmented with more sacks of snow, metal railings and tyres. The first attempts to push back protesters came as dawn broke, amid a swirling blizzard. Police began their assault on the impromptu barricades on Hrushevskogo Street, where clashes have been ongoing since Sunday evening. Videos circulated of the police beating and kicking protesters, many of whom were hurling rocks and molotov cocktails at officers in scenes that shocked residents of Kiev. Political protest has been a way of life here since the 2004 Orange Revolution, but before this week, rallies have never descended into violence. Police launched another attack on protesters shortly after midday Kiev time (10am GMT), dispersing a crowd of thousands of people, moving them hundreds of metres back. They used teargas and rubber bullets and beat fleeing protesters with sticks. Some people were arrested. Then thousands of policemen regrouped into new lines to take shelter from stones being hurled at them. aceful way” and saying he was against “bloodshed and forceful methods”. He asked the opposition to hold talks and demanded that people “not heed the calls of political radicals”. “I know that this very second he [the president] is watching this live broadcast. You, the president, you know that snap elections will change the situation without blood, and we’ll do everything to achieve this,” Klitschko told the crowd in Independence Square on Wednesday evening. He added that talks with Yanukovych that started on Wednesday would have to continue on Thursday, otherwise “we will go on the attack”. Yanukovych on Wednesday met the three main opposition leaders – Klitschko, nationalist Oleh Tyahnybok, and Arseniy Yatsenyuk, of jailed former prime minister Yulia Tymoshenko’s party – for three hours. The prime minister, Mykola Azarov, struck a defiant note, blaming the victims for their own deaths and saying that the government had “no other option” but to use force against protesters. 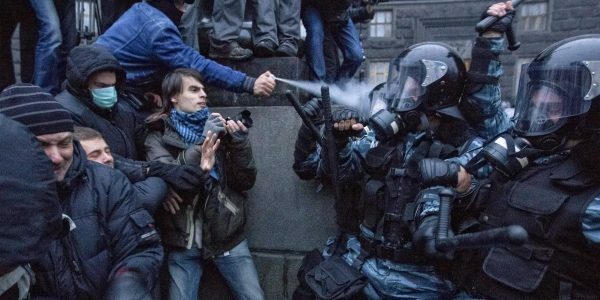 Azarov said terrorists were threatening the lives of ordinary citizens in Kiev, and that the “criminal” actions of protesters would be punished and suggested further force was possible. He was due to appear at the World Economic Forum in Davos later on Wednesday, but his invitation was reportedly withdrawn. Earlier the protesters reconstructed their barricades as thousands came to support them. Vasyl, 76, a pensioner from the central Cherkasy region, said: “They [the authorities] provoked this. We are unarmed but nevertheless they are afraid of us.” His friend Pavlo, 60, wearing stripes in the colours of Ukrainian and EU flags, said he came to support the protesters and was ready to throw stones at police. An exhausted Orthodox priest with a huge cross around his neck trudged between the lines, trying unsuccessful to bring calm. “I’m here to placate the violence. My congregation is here,” he said. The protests began when Yanukovych turned his back on a planned association agreement with the European Union, citing financial pressure and the need for closer ties with Russia. They have since grown into a more general protest against Yanukovych’s government, and have also attracted a noisy minority who hold radical far-right views. The United States revoked visas to several Ukrainian officials on Wednesday over the violence in November and December of last year. The main voice of support for tough action has come from Moscow, where on Tuesday, foreign minister Sergei Lavrov accused European politicians of “fuelling” the violence in Ukraine, and noted that in any European country, the seizure of public buildings and violence against police would also be met with force. NextTerrorist Plots, Hatched by the F.B.I.